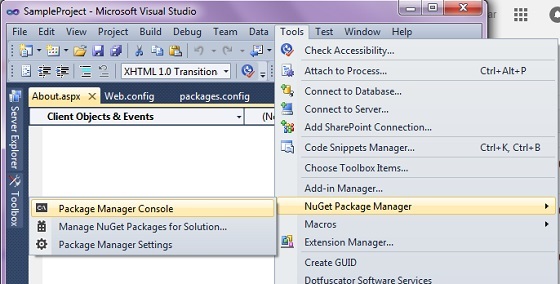 NuGet Package Manage is a collection of tools to automate the process of Downloading, Installing, Upgrading, Configuring and Removing package from a Visual Studio project. 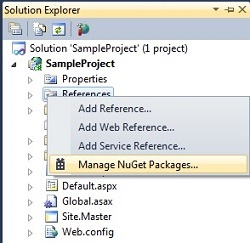 goto --> Solution Explorer --> right-click --> on References or Project Name --> click on Manage NuGet Packages. When you select a package, an Install button appears, and a description is shown in the right-hand side. b.) Script folder created under this folder JQuery files are copied. d.) Web.Config or App.Config file might be updated in your project. When the installation completes, the Install button turns into a green check mark to indicate that the package was installed correctly. Open the Manage NuGet Packages Window and click on Installed Packages tab from left hand side and select ALL is used to display the list of installed packages. Select the package you want to uninstall and then click Uninstall to remove the package. b.) Script folder created under this folder JQuery files are deleted or removed. Open the Manage NuGet Packages Window and make sure the Updates tab is selected to display the list of packages that have newer versions available. If any packages have updates available, they will be listed in the center pane. 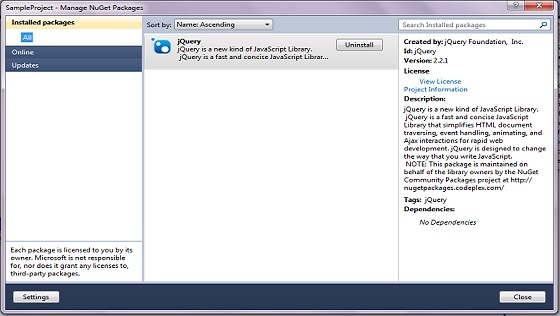 The following screenshot shows a newer version of jQuery available. 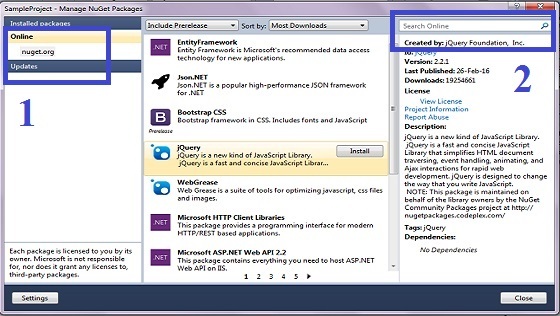 open visual studio -- Tools Menu --> NuGet Package Manager --> click on Package Manager Console. The Package Manager Console Command window is display in visual studio below. choose one source in package source that you want your commands to use. select the default project that you want your commands to work. In the Package Manager Console command window, enter Get-Package -ListAvailable in the Command window to see a list of all packages that are available in the selected package source. when we execute Get-Package -ListAvailable, that command is going to list thousands of packages. It makes better sense to specify a filter. To check if there are newer versions available for any installed packages, enter Get-Package -updates at the prompt. If you do not already know the name of the package you want to remove, enter Get-Package at the prompt without any flags to see a list of all of the packages that are currently installed. 0 Komentar untuk "ASP.NET : Nuget Package Manage"